Opera today released a new version of its Opera Mini browser for Android and gave it a native ad blocker. Opera claims the ad blocker serves two purposes: 1. It speeds up page load times by 40%, and 2. It reduces data consumption up to 14% to help lower phone bills. Faster load times are always desirable, but especially so when network conditions are not at their best. Similarly, many consumers subscribe to metered service plans, which makes every bit of data count. The ad blocker in Opera Mini is not on by default, users must activate it in the settings menu. Opera says the browser also now allows users to set home screen shortcuts to specific web pages, and features a redesigned Discover section for curated news feeds. 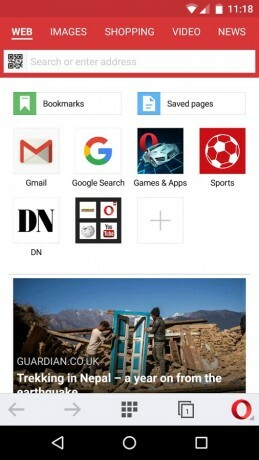 Opera Mini for Android is free to download from the Google Play Store. Google today said it is rolling out new controls for managing advertisements that appear in apps and on mobile web sites. Moving forward, people will be able to use the ad preferences settings to put the kibosh on reminder ads that often show up after user's search for specific products. The Opera web browser for Android now includes a free VPN service, for securing data over untrusted networks such as public Wi-Fi. Opera for Android version 51 includes the feature, which is activated with a simple toggle, requiring no sign-in nor account. ZTE today showed off the Axon 7 Mini, a smaller version of its flagship handset. Like the original, the Mini features an aluminum unibody chassis in silver or gold with 2.5D glass on the front and a fingerprint sensor on the back.